I've never understood why people pay TONS of money for bottled vinaigrettes when it's so simple to make your own. Basically, I use 1 part vinegar to 3 parts oil. Add some mustard and whatever extra flavorings you like, and there you have it. It's really just that simple and it's ready in minutes. This recipe is slightly different from Dina's Honey Dijon Vinaigrette, (which I absolutely LOVE), but it's always nice to have variations, don't you think? I recently showed this recipe to Terri and Phil, and their son Nicholas was my little helper guy. I got such a kick out of the fact that it was time for bed and he wanted to keep cooking with Uncle Joey. How awesome is that? Who knows? Maybe some day he'll be a future chef! Hey, it could happen! In medium sized mixing bowl, whisk together all of the ingredients except the oil. SLOWLY add the oil in a steady thin stream while vigorously whisking constantly. (you can also use a mixer with a wire whisk attachment). Adjust the seasoning if needed*, then pour into an airtight container or salad dressing decanter. Store in the fridge. *When you test to see if the seasoning is right, taste it on a piece of whatever it is you'll be serving. If you're making the dressing for a pasta salad, taste the dressing on a piece of cooked pasta. If it's a tossed green salad, taste it on a piece of lettuce. You'll get a better idea of whether or not to add more of anything. I like to enjoy this dressing over a Chef's Salad, which is basically composed of different kinds of sliced or cubed meats and cheeses on a bed of lettuce. Sometimes I'll add a few slices of apple, which go nicely if you use apple cider vinegar in the dressing. This is definitely a recipe that lends itself to experimentation. The components stay the same but there are countless combinations. All you need is any variety of mustard, an acid, a sweetener, and any variety of oil. Try different flavored vinegars, such as raspberry, champagne, or white wine, etc. Also try adding chopped fresh herbs such as basil, rosemary, or parsley. For a citrus vinaigrette, use freshly squeezed lemon and/or lime juice instead of vinegar, and a tbs of orange marmalade instead of the honey. If you're counting your carbs, substitute Splenda for the honey and choose a vinegar with zero carbs. I started reading about basic poached chicken. It's really more of a cooking method than an exact recipe. You can poach chicken in just about any kind of liquid, even something as simple as plain water. I guess that sounds pretty bland, but your chicken will still be perfectly cooked, and then you'll have a blank slate to use a base for any recipe. Of course, the more flavors you add to your poaching liquid, the more flavor your chicken will have. The result is a delicious and succulent chicken that is perfect for using in any recipe where you'd normally use a store-bought rotisserie chicken. The advantage of a poached chicken is that it's lower in sodium and lower in fat, while still staying moist and delicious. Your poaching liquid can be fat-free chicken broth, white wine, water infused with fresh or dried herbs and chopped vegetables, fruit juices, light coconut milk – pretty much anything. These are the ingredients I added to plain water. The chicken turned out perfectly! Place all ingredients except chicken in a large straight sided skillet or pot. Add enough water to cover by 1/2 inch. Bring it to a boil over high heat. Boil for 3 minutes. Add chicken. Bring it back to a low low simmer, just enough to see a tiny bubble here and there. Cover skillet with a tight fitting lid and remove from heat. Let it stand until the chicken is tender and cooked through, about 15-18 minutes. Immediately remove chicken from the poaching liquid. Using two forks, pull the chicken apart into shreds, or just slice it with a large knife. Add to salads, soups, tacos, and sandwiches. You can flavor the poaching liquid with whatever aromatics you have on hand. This recipe is just a guideline. Try fresh ginger and soy sauce, or oranges and fresh rosemary. Actually, come to think of it, if I were doing soy sauce and ginger, I'd probably add a splash of pineapple juice. Yum! *You may want to just squeeze a little lemon juice into the pan instead of adding the lemon slices. If you leave the slices in the water too long, the rind starts to add a bitterness to the broth. Another alternative would be to add some grated lemon zest, or you can just omit it altogether. Speaking of the broth, you can freeze it and save it for use in other soups or stews or sauces. If you make it like I've listed above, it's basically like making home made chicken stock. Simply freeze it in ice cube trays, then you can use a little or a lot as you need it. Easy!! 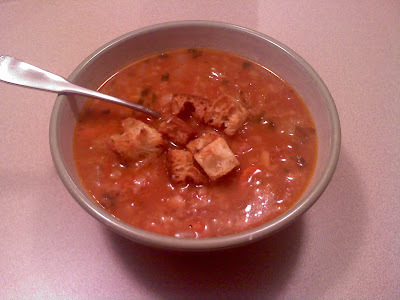 There are certain times when you just need to have a good hearty bowl of soup. Maybe you've been snowed in, maybe you just spent two hours outside shoveling snow, or maybe your job requires you to work outside in the bitter cold. A big bowl of home made soup always seems to hit the spot! When I was growing up, we'd come home from playing out in the snow all day, having snowball fights, building snowmen, or sledding, and Mom would always have a huge pot of soup simmering on the stove. It's actually one of my favorite childhood memories. This soup is the perfect thing to warm you up and thaw you out. My sister-in-law, Marianne, made it for my family's New Year's Day get together, and I immediately asked her if I could have the recipe. Just wait 'til you taste it. It's SO delicious! Hi, Joe, here is the recipe that Tricia's mother-in-law, Beth DelBorrello gave me. Just double it for a crowd. Heat the oil in a large stockpot over medium heat. Add the onions, carrots, fennel, and garlic and cook over medium low heat for 10 minutes, until tender. Add the crustless ciabatta cubes and cook for 5 more minutes giving it stir every so often. Add the chopped tomatoes to the pot along with the chicken stock, red wine, basil, 1 tablespoon salt and 1 1/2 tsp pepper. Bring soup to a boil, lower the heat and allow to simmer, partially covered for 45 minutes, stirring every so often. The bread will soften and thicken the soup. Right before serving, use a wire whisk until the bread is broken up. Add some Parmesan cheese to taste. Meanwhile, preheat the oven to 375. For the topping place the ciabatta, pancetta, and basil leaves on a large baking sheet large enough to hold them in a single layer. Drizzle with olive oil, sprinkle with salt and pepper and toss well. Bake, stirring occasionally, for 20 to 25 minutes until the ingredients are crisp and golden brown. The basil will turn dark and crisp, which is perfectly fine. Add 1/ 2 cup Parmesan cheese on top and toss. Serve as a topping for the soup. The thing that makes it so hearty is the bread. Don't skimp on the bread! It's used to thicken the soup as well as to flavor it. Delish! When Katie and Anthony came over for dinner, I told Anthony to choose what we should have for dessert. It seemed only fair, considering that Katie got to choose what we were having for dinner. (Being the carnivore that she is, she chose Classic Beef Pot Roast. Come to think of it, that's what she chooses every time!) Anyway, this pie was Anthony's pick. Sounds good to me! If you know me, you know how much I love an apple pie. This one is pretty basic. You have your sugar and your apples and your spices, but it's all about the crumb topping. LOVE it! Top it with some Vanilla Ice Cream or whipped cream or Home Made Caramel Sauce, or dare I say it ALL OF THE ABOVE, and you have a slice of heaven on a plate! Roll out the pie crust and place it in a deep pie plate. Tuck the excess dough into the pie plate and flute to make a decorative edge. Set aside. In a large skillet, over medium heat, melt the 6 tbs. butter. Drain the apples, and add them to the skillet along with the sugar, nutmeg, cinnamon, and salt. Gently toss until well coated. Add flour and gently toss again until the juice thickens. Remove from heat and pour apples into the prepared pie crust. Mix the brown sugar and flour together. Cut the butter into the sugar/flour mixture, until it resembles coarse crumbs. (I know we're always told not to use our hands to mix in the butter because the heat from our hands softens the butter, but I always get in there with my hands to make sure it all comes together. What can I say, it's just how I do it!) When your crumb mixture is well incorporated, then pour it over the top of your pie, making sure to cover everything to the edges. Sprinkle the top with more cinnamon. Place the pie in the oven and bake for about 40 minutes or until the crust is golden. Remove to a wire rack to cool for 10-15 minutes before serving, or let it cool completely. As I always say, the first rule of cinnamon is that you can never have too much. I never measure it, so the amount listed is just a guess. I always add lots of cinnamon, and then taste an apple to see if it's enough. 10 times out of 10, I wind up adding more. If you'd like to see a demonstration of how to "tuck the excess dough into the pie plate and flute to make a decorative edge", just watch my video on How to Make a Lattice Top. The "fluting" part is in the last section of the video, after we finish weaving the top crust. Great then!